Blog: Can conferences be developed in a more inclusive way? REACH Communications and Knowledge Exchange Manager Alice Chautard blogs about the benefits of 'inclusive conferences' and invites academics, researchers and practitioners to join the conference conversation, by participating in a short online survey. Conferences provide scientists and professionals with the opportunity to disseminate their work, network, and form collaborative relationships for future work – they are thus important for career development. However, for institutions organising conferences, these events are often first and foremost an opportunity to demonstrate excellence and showcase cutting edge work by leading professionals or academics. As women are still underrepresented in academic and scientific professions, especially in leadership roles, this is often reflected in the speaker lineup and other aspects of the conference programme and logistics. At REACH, and in collaboration with the Equality and Diversity programme at the School of Geography and the Environment, we are producing a ‘How to’ guide to help event organisers create more inclusive conferences. Why develop an inclusive conference? Being a speaker at a conference can considerably increase your profile. By inviting more women and other groups that are under-represented in the professional world, we publicly acknowledge that their work and views are of value, and make a significant contribution to the sector, field, or discipline. This can give them more visibility and exposure, and thus support their career progression, helping them with applications for grants, jobs, funding or promotions. Conferences are an excellent avenue for generating and reinforcing new connections, partnerships, ideas or collaborative projects. Most conferences dedicate a significant proportion of their schedule to mingling and networking activities: either through coffee breaks, drinks reception, social events, or dinners. If you have been invited as a speaker or a special guest, chances are you will be recognised and approached more. 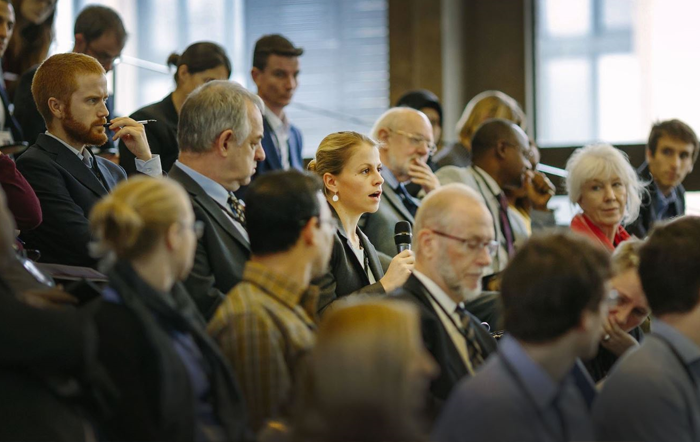 Interestingly, recent research by Elsevier has found that women are less likely than men to collaborate internationally and across the academic and corporate sectors on research papers – could better organising conferences help address this gap? Besides, if conference organisers consistently invite the same people, we risk limiting opportunities to diversify the types of connections, collaborations and new ideas that are generated. Last, but not least, it is important that early career researchers and professionals see diverse examples of professional speakers. People who have succeeded regardless of their gender, ethnicity, sexuality etc. can become important role models for the next generation of academics. Over the past few years there has been a real push away from all male panels – there is even a Tumblr page dedicated to it and a popular #allmalepanel hashtag on Twitter. Many men are also taking the pledge to not accept an invitation to speak if there isn’t at least another woman on the panel. This is certainly an important and necessary move – but we must do more. Securing women on panels and as speakers as part of a conference is important but not sufficient to ensure an event is ‘inclusive’. Conference organisers should work to ensure women have equal opportunities to participate and actively engage in discussions as speakers, in networking opportunities, or as members of the audiences. For instance, in a study of nearly 250 seminars across 10 countries, the authors found that any given question was 2.5 more likely to be asked by a man. Childcare responsibilities can be a deterrent or can simply prevent attendance to conferences – both men and women have childcare responsibilities, but the responsibility is still largely borne by women. And lastly, we ought to realise that attendance and participation at conference depends on safety (physical, verbal); and that safety is closely tied with gender, sexual orientation, religion, ethnicity and other factors. Evidence and individual accounts suggest that many minorities also experience challenges in being excluded or discriminated against at conferences on account of their ethnicity, religion, sexual orientation, physical abilities or other characteristics of their identity. ‘All male panels’ are not just all male - they also often tend to be all white male. Many conferences do not make provisions for physically impaired attendees, or attendees with autism or specific learning difficulties. This points to shifting the focus from solely gender to addressing wider power dynamics which ultimately influence who will speak at a conference and what will be discussed. Of course, inequality of opportunity within academia is not something conferences alone can tackle, but they are a good place to start because of their critical role for career development. In many ways, organisers can address these gaps by taking small steps – others obviously require more systemic thinking and changes, but it is not impossible. The good news is that many conferences are now proactively trying to make conferences more inclusive and their panels more diverse, and there are many blogs and articles online providing tips and recommendations. Yet, to my knowledge, there isn’t one go-to place where event organisers can find comprehensive advice to making conferences inclusive. Our guide will collect and present recommendations from colleagues, conference organisers, gender experts, and academics, and gather examples of best practices to provide a single source of advice and guidance. We want to hear your thoughts, ideas, and experiences - take the survey! We have created a survey to collect experiences, identify barriers to making conferences more inclusive as well as potential solutions, and examples of best practices.